In this third installment, we will discuss what weapons testing did to automobiles; specifically the “Windshield Pitting Epidemic” of 1954 following Castle Bravo – which was the largest nuclear test ever conducted by the United States – and perhaps even more importantly, how authorities dealt with public perception. 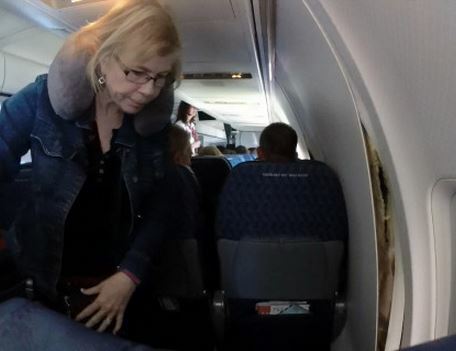 But first, let’s take a look at an aircraft emergency that occurred in the past week, when American Airlines Flight 2293 had to make an emergency landing because the cabin walls began ripping apart after takeoff. The Boeing 757 had departed from San Francisco International Airport shortly before 1 p.m. on Monday, October 13th en route to Dallas. A possible blown air duct was to blame for the interior panels pulling apart from the cabin wall on Row 14, which spanned the width of the aircraft, including the floor and the ceiling. Even though the plane’s problem was related to pressurization, the cabin did not lose pressure and oxygen masks did not deploy, although passenger accounts stated that they “felt” a change in pressurization. Officials were quick to say the issue was “only cosmetic” and that the 184 passengers and six crew members on the flight were never at any risk. Aviation experts were also widely quoted as saying “the panels are only there so you don’t have to look at bare walls” and that it was “only plastic” that gave way in the incident, ignoring the fact that plastic cabin walls are bolted in place by metal clamps and structural lugs. The incident of flight 2293 is intriguing from several perspectives. 1) Passengers reported extremely loud “pop pop pop” sounds during takeoff, before the cabin walls began to rip apart, likening it to the sound of “bowling balls being dropped on the plane.” This sound could be attributed to the metal clamps or structural lugs failing at multiple points at once. 2) Passengers reported a change in cabin pressure although the pilot and airline deny that this occurred, in spite of the severity of the cabin wall damage. 3) After the cabin walls ripped apart, flight crew personnel stuck their hands in the holes and told passengers they were “looking for daylight” – although at least one past airline emergency (discussed below) shows that would be the last thing you would want to do in a situation like this. 4) The pilot, at first, continued to fly on course and it wasn’t until he walked back and saw passengers filming and taking pictures of the damage that he decided to turn the plane around for an emergency landing. 5) Airline experts that spoke to the media downplayed the severity of the incident, by continually referring to the damage as “plastic” and “cosmetic,” and withholding the fact that cabin walls are held in place by metal clamps and structure lugs that may have given way due to fatigue. At Airliners.net, an aviation forum for pilots, crew members, industry insiders and aviation enthusiasts, the interviews posted on social media were met with a less-than-empathetic response from the majority of posters, who seemed to feel that terrified passengers have no business commenting on camera in regards to incidents involving airplanes (because it makes the industry look bad), and several even went as far as to make fun of the passengers’ concern about their predicament. Can any tech people here describe what happened in the photos??? I’ve never seen a depressurisation do that to a interior panel, though. Well it looks like the wall came apart at the seam. Not exactly the plane falling apart. American has already explained that an air duct failed. This most likely lead to high pressure air entering areas it wasn’t intended to, which pushed the interior panels in, until the could vent. Air ducts fail periodically in flight. It’s not common, but it’s not unheard of. Most often, a clamp blows apart from fatigue or improper installation. NOT something you want to experience, but also NOT a life-threatening situation…. It must have been terrifying, yeah. But coming apart in mid air? Not really. Overdramatic passengers are usually the worst sources of technical information on a mechanical issue. or use social media to inform the world that the sky (and the person posting) is falling! So many A-Netters have an incredible lack of empathy to passengers who experience something abnormal about a flight. The average passenger is not in the aviation business and does not spend their day on A-Net, they have lives. Their knowledge of the mechanics and operation of aviation is limited. They are flying in a tube, miles high in the air, almost as fast as the speed of sound. Everyone is fully aware of what can happen when something catastrophic happens, even though many know that statistically it is very very safe. They have limited knowledge of the seriousness of what is occurring and they have no control over the aircraft; you can’t just pull over on the side of the highway. They hear loud sounds, different than what they are used to, and interior panels start falling, sometimes on top of them. What are they supposed to think? Even with the amount of A-Net surfing, I would be nervous at a minimum and possibly even terrified. Why is that concept so difficult for people on this forum to comprehend? I agree with the lack of empathy. It is easy to be an armchair quarterback safely sitting at your computer saying the passengers were reacting poorly. If I was on that 757 and both sides of the interior panels tore I’d be wondering if it was due to a hull breach or something different as well. I’d likely be nervous and for those who say otherwise, I challenge your assessment. Now factor in the general public who knows very little about aviation and of course you’ll have nervous passengers. My mind would be thinking of that Aloha Airlines 732 that had part of its outer hull pull away. Yeah I’d nervous. I wonder how many pilots know about the Wigner Effect? Judging from many of the responses here, I would say none. The health effects of flying through radioactive fallout probably isn’t on their radar either, although I personally know of a few enlightened pilots bringing Geiger counters on flights, with at least one reporting readings on his blog for a research project on high altitude radiation. Aloha Airlines Flight 243 was a scheduled Aloha Airlines flight between Hilo and Honolulu in Hawaii. 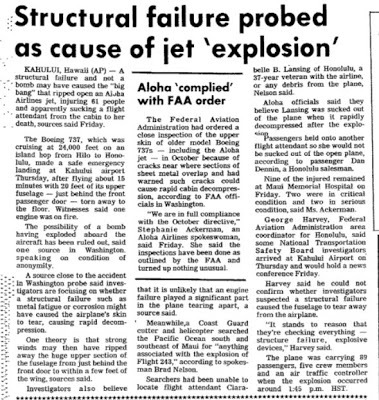 On April 28, 1988, a Boeing 737-297 serving the flight suffered extensive damage after an explosive decompression, but was able to land safely at Kahului Airport on Maui. There was one fatality, flight attendant Clarabelle Lansing, who was sucked out of the airplane. Another 65 passengers and crew were injured, and managed to escape Clarabelle’s fate because they were buckled into their seats. 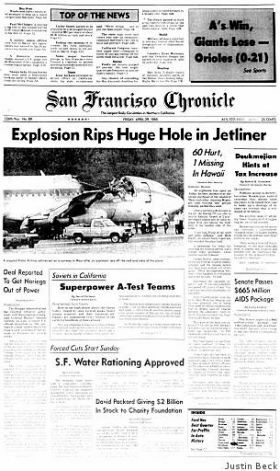 The safe landing of the aircraft despite the substantial damage inflicted by the explosive decompression established Aloha Airlines Flight 243 as a significant event in the history of aviation, with far-reaching effects on aviation safety policies and procedures. Around 13:48, as the aircraft reached its normal flight altitude of 24,000 feet, a small section on the left side of the roof ruptured with a “whooshing” sound. The captain felt the aircraft roll left and right, and the controls went loose. The first officer noticed pieces of grey insulation floating over the cabin. The door to the cockpit was gone so the captain could look behind him and see blue sky. The resulting explosive decompression tore off a large section of the roof, consisting of the entire top half of the aircraft skin extending from just behind the cockpit to the fore-wing area. First officer Madeline Tompkins was flying the plane at the time of the incident. After discovering the damage, the captain took over and steered the plane to the closest airport, on Maui island. Thirteen minutes later, the crew performed an emergency landing. Upon landing, the crew deployed the aircraft’s emergency evacuation slides and evacuated passengers from the aircraft quickly. Tompkins assisted passengers down the evacuation slide. In all, 65 people were reported injured, eight seriously. 58 year old Flight Attendant Clarabelle Lansing was the only fatality; she was sucked out of the plane while standing near the fifth row seats. Her body was never found. She was a veteran flight attendant of 37 years at the time of the accident. Eight others suffered serious injuries. A section from behind the cockpit was separated equal to one-quarter of the fuselage length. All the passengers were in their seats and belted during depressurization. A major portion of the upper crown skin and fuselage structure of section 43 separated in flight causing an explosive decompression of the cabin. Final damage consisted of the total loss of a portion of the upper crown skin, and damage to other fuselage structure and walls in section 43. Damage extended from aft of the main cabin entrance door, rearward about 18.5 feet. As a result of the accident, the airplane was determined to be damaged beyond repair. Additional damage to the airplane included dented horizontal stabilizers. Both of them were struck from the flying debris. Despite an extensive search of the ocean at the estimated location of the incident, neither Lansing’s body nor the piece of the fuselage that was blown off the plane were ever found. 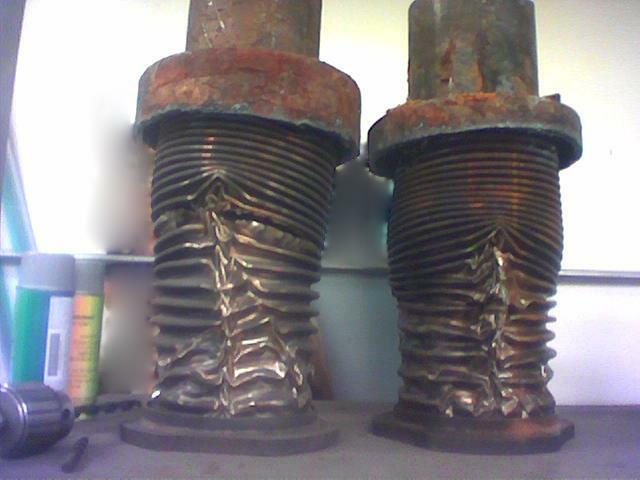 Investigation by the NTSB concluded that the accident was caused by metal fatigue exacerbated by crevice corrosion. The plane was 19 years old (the same age as American Airlines Flight 2293) and operated in a coastal environment, with exposure to salt and humidity. The metal fatigue caused the fuselage integrity to fail from multiple points at once. According to the official NTSB report of the investigation, Gayle Yamamoto, a passenger, noticed a crack in the fuselage upon boarding the aircraft prior to the ill-fated flight, but did not notify anyone. In regards to American Airlines Flight 2293, it is interesting to note that “cabin walls ripping apart” has so far been explained away so carelessly in the media without input from the NTSB, or from the mechanical engineers that have had an opportunity to inspect the damage and its possible cause…but that’s business as usual for any industry that trades stocks, and finds itself defending a viral video of a terrifying ordeal involving civilians. It is doubtful that the engineers or mechanics will be allowed to publicly discuss what they find at this point anyway, especially in light of a recent complaint against carriers for maintainance and safety issues of airlines. It will only be a matter of time before some unlucky commercial jet has the top peel away ala Aloha Air to bring Wigner into the public eye, although we have had many such incidents with smaller planes, such as the air tanker that recently crashed fighting a Yosemite fire after its left wing fell off. The Yosemite air tanker is not the only incident; this happened to the wing of another tanker plane in 2013, and the tail of a tanker plane in May of 2014. The so-called “hysterical passengers” on flight 2293 chided by aviation enthusiasts at Airliners.net also remind me of another Wigner-style event with shady nuclear connections and subsequent dismissive handling by authorities: the great “Windshield Pitting Epidemic” of 1954, which just happens to be included in our segment this week of The Wigner Effect interview. 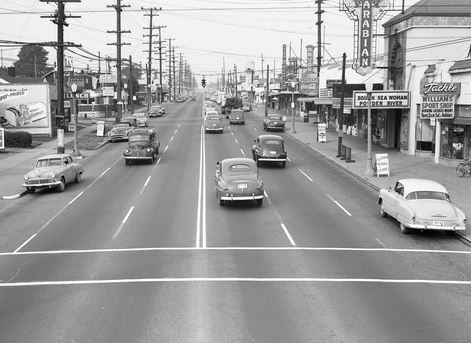 The Seattle Windshield Pitting Epidemic is a phenomenon which affected Bellingham, Seattle, and other communities of Washington state in April, 1954. It later spread across the US to multiple states, including Florida. It was characterized by the sudden onset of previously unnoticed windshield defects, leading residents to believe that an environmental cause was to blame. It was originally thought to be the work of vandals but the rate of pitting was so great that residents began to attribute it to everything from sand flea eggs to nuclear bomb testing, especially in light of recent nuclear tests. On March 1, 1954, the United States military tested nuclear bombs in the ocean around Bikini Atoll in the Pacific Ocean to see what kind of damage they would do to ships. The largest explosion was set off 90 feet underwater and was nicknamed Castle Bravo. The bomb blasted a crater 2 kilometers wide in the coral reef and obliterated ocean life in the area. Smithsonian scientists surveyed the reef before and after the explosion to study how radiation impacts marine life. The casualties also included unfortunate and indigenous Pacific Islanders. The description of the widespread windshield damage varied from actual holes to pit marks covering every known shape: chips, scratches, mars, pits, holes, crumbling, blemishes, blurs, blots and cracks. Some people even claim that the damage has happened before their very eyes, including several police officers. Within a week, the news and the so-called “pitting epidemic” had reached metropolitan Seattle. As the newspapers began to feature the story, more and more reports of pitting were called in from other affected states in the Plains, Midwest, and several counties in Florida. In Seattle alone, deputies examined more than 15,000 cars, and found damage to more than 3,000 of them. The Sheriff and his deputies believed that this level of damage could not be explained by ordinary road use. The law enforcement officers also found odd little pellets near some of the cars. The pellets reacted “violently” when a lead pencil was placed next to them, but not when a ballpoint pen was so placed, indicating a possible magnetic component to the material. At the height of the incident on the night of April 15, the Seattle mayor even sought emergency assistance from President Dwight Eisenhower. Not surprisingly, the US Government wanted nothing to do with any event that would cast more suspicion on the effects of weapons testing. Finally, Sergeant Max Allison of the Seattle police crime laboratory stated that the pitting reports consisted of “5 per cent hoodlum-ism, and 95 per cent public hysteria.” By April 17, the pitting suddenly stopped, and complaints ceased. 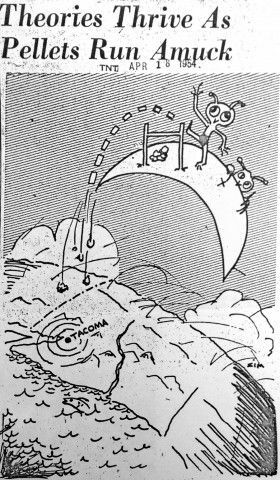 Any references to the Castle Bravo nuclear test were dismissed as theatrics from anti-nukers or the ramblings of crazy conspiracy theorists. To this day, sociologists and psychologists still lump this incident alongside other mass hysteria events, such as Orson Welles’ Martian invasion panic of 1938. 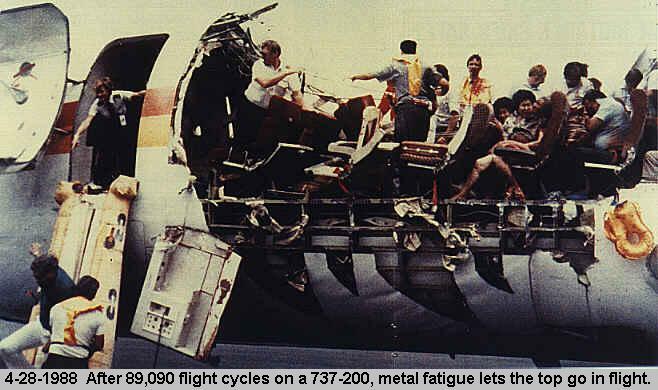 The reactionary comments in both the American Airline Flight #2293 cabin wall incident, and the Windshield Epidemic of 1954 are not examples of mass hysteria, but rather stunning examples of normalcy bias, something a great deal of Americans seem to have fallen victim to. For those of you who still prefer to critically think, in the 4th installment of the Wigner Effect interview we will discuss radiochemistry and the effect on glass and computer components. We will also discuss what was happening in terms of the health of US citizens during the weapons testing era, especially conjoined twinning – which seems to be making an unfortunate comeback post-Fukushima. We will also discuss nano particles and electric fields, which will be much-needed background when we get into the build up of static electricity on aircraft, and the behavior of radioactive particles – known as “aggregation kinetics” – when a highly charged airplane skin travels through radioactive plumes. Thank you for your excellent work. I need to do a re-blog-fest of Green Road.